Hello Beauties. Hope you've had a lovely weekend. I haven't written a post like this in a little while, but I love writing helpful posts for you all, so hopefully this post will inspire you to keep creating content in 2018. It's no secret that the Blogosphere has become a bit of a giant and sometimes it's easy to get bogged down. However, I'm making it my blogging goal in 2018 to not only keep myself motivated, but also help my readers along the way. Storytime blog posts and videos have become hugely popular, especially throughout 2017. Everyone has a story to tell and you never know who your story might help! It's true that a picture can say a thousand words. Try a post with just your favourite pictures, no words required. Put on your Spotify playlist or equivalent and shuffle five times. Write down each song in your blog post and explain what it means to you, this could get funny! 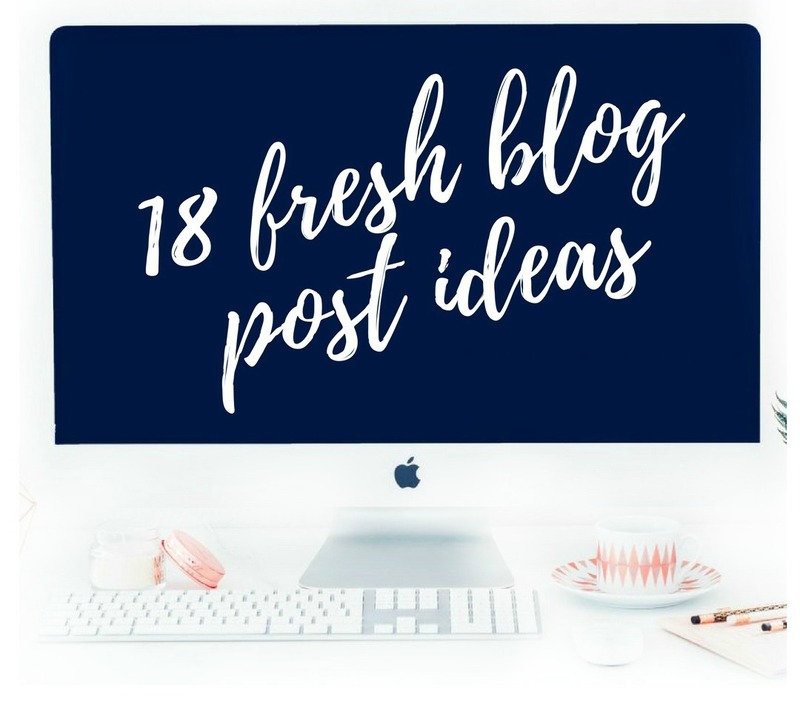 Routine posts are so engaging and will no doubt give your readers some useful tips and tricks! Get inspired and share your dreams, motivation and plans with a monthly mood board, which can easily be made using canva. If you live in the UK then you know all about rainy days. Share your rainy day routine, whether it's cosying up by the fire or binge watching your favourite Netflix series. These types of posts will never get old. They can be informative, informal and really interesting to read. For the inquisitive amongst us, why not create a pictorial tour of your beauty room, make-up storage or bathroom set up? If you're into fitness, why not show us around your gym and your favourite machines to work out on. The opportunities are endless. Do you have a passion for positivity, why not start your own initiative and write about it on your blog? It could be something as simple as creating your own hashtag to engage with like minded people or starting a new blog or website about a more niche topic you love! Whether you're writing a checklist for your next shopping spree, or perhaps preparing for a vacation. Share your checklist on your blog and inspire your readers to feel organised with you. One of my most popular posts was my Day in the life of a Marketing Campaigns Officer. Readers love to know what goes on behind the scenes and these kind of posts are highly engaging for your audience. This week I'm starting group personal training with my work friends and I will be documenting it weekly on my blog. Do you have any short/long term challenges you could write about too? Please don't tell me I'm the only one that asks google every single question that comes into my mind?If you have figured out a solution to a problem then share it on your blog. You might be surprised how many people were thinking the same too or were hoping to find an answer! Know an easy peasy way to edit your blog photo's or are you a pro when it comes to achieving great photography using your iphone? Cheat Sheets are useful and fun to create, plus your readers will be forever grateful for your resources. Self care has become a huge topic in the blogosphere and for good reason too. We often disregard our own self care, so if you have any handy advice on how to install some inner calm why not share it on your blog. You could even start a series! What industry do you work in? It's likely that your valuable advice could help someone looking to start or enhance their career. Each day write down something you are grateful for and share it on your blog at the end of the week. There's always room for #PositiveVibes on your blog!